Thread forming tri-lobular screws are used for fixing into metal components – a form of self-tapping screw, they use the tougher tri-lobular design which assists the grain flow as it effectively deforms a thread into thicker material than could be managed with a standard self-tapping screw. This process results in a thread geometry that is more accurate than a standard self-tapper and so provides a stronger fixing which is more resistant to loosening under vibration. Almost a machine screw in concept these thread forming screws leave a tapped hole when removed and may be replaced with a standard rolled thread machine screw if required. Heads and drives include countersunk, pan, and hexagonal/flange types with cross recess, multi-splined (star) or hexagonal formats. Hardened steel is normal for most applications and is suitable for use in a variety of metals providing the correct diameters pilot holes are in situ. 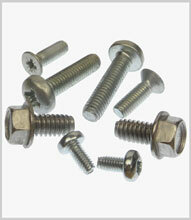 Stainless steel thread forming screws are also freely available but tend to be used in softer materials such as aluminium and zinc.